[Special Report Team] It is unchangeable truth that customers always choose good products.Recently many companies in a variety of businesses are showing provocative marketing as overall consumption in the market has been declining. Those provocative advertisements are either implying that you are out of trend if you don’t buy a particular product or overly emphasizing the top star’s image instead of product function. The advertisements that exaggerated the product’s function effect falsely are being caught often lately. However, the result of those bombastic advertisements does not come out as good as expected because consumers find out the convenience the real value of the product from actual product experience. Real product power comes from the high quality those products with excellent quality are always a winner in the market regardless of the advertisements. Consumers always want to use a product, nice reliable. Here is a company that is catching popularity among consumers by applying consumers’ need to their products a marketing technique. It is CERAGEM, (CEO Lee Whan-seong), a medical device manufacturing company that has been accumulating trust from customers with their free product experience service. Ceragem’s thermal massagers are ranked No. 1 in the domestic market. In addition, Ceragem is the company that developed the automatic thermal massager for the first time in Korea exported it to the overseas market. Since its first business launching in 1999, Ceragem has been reinforcing the company’s competitiveness for 15 years by establishing the global infrastructure continuously. With that effort, Ceragem was able to accomplish a miraculous success by operating 3000 Ceragem Centers in over 70 countries in 10 years since the first product launching. In fact, Ceragem’s wonderful business outcome is hard to be achieved. Even just the planning would be difficult for many other companies. However, Ceragem has achieved something that nobody imagined before with their continuous challenge spirit passion to improve quality service for consumers. Honest sincere marketing as well as high product quality captured the consumers’ heart all over the world. Ceragem is growing as a global company trying to achieve the goal to make a company worth a 10 trillion won in value by 2020. What is the value of the Ceragem differentiated from others? >> Global Bestseller, Competitiveness of Ceragem’s Thermal Massager! Ceragem’s thermal automatic made debut in the market in 1998. The thermal massager combined the oriental medicine principal with the western one. This high quality product with its ergonomic design stable power supply system caught consumers’ eyes in the world. Consumers were not the only one who paid attention to Ceragem’s thermal massager. The manufacturers of the related industry in Korea overseas paid big attention to the outcome of Ceragem as well. Ceragem has developed various high technologies to strengthen the thermal massager function such as multifunctional LCD remote control, thermal massager for calf, special heating elements a precise temperature control system. Ceragem’s technology brought the improvement of technology in the thermal massager industry. Ceragem thermal massager applied the principal of the alternative medicine provides a concentrated thermal stimulation on the spine. The internal projector made with jade provides heat, massage acupressure on the spine following the program. The massager relaxes muscle, reduces pain improves blood circulation while massaging the spinal nerves closely connected to body organs. The biggest point of the Ceragem’s thermal massager is that it provides care for our body damaged by bad habits stress. The spinal nerves which controls all of body functions is like a lifeline of our body. Health problem can be occurred from the pressed spinal nerves due to wrong alignment of the spine. Back pain shoulder pain are very common symptoms caused by it. Those pains are the result of the bad spine care from bad habits rather than a predestined disease. Ceragem has been focusing on the development of the effective spine thermal massager to ease the pains that many people have. As a leader in the thermal massager industry in Korea, Ceragem has been developing a variety of new technologies the world-class products continuously. Now Ceragem’s technology power has earned recognition in Korea overseas. Ceragem Research Center’s played a huge role for Ceragem to be at the current position. Ceragem established the Ceragem Research Center in the company to reinforce the thermal massager technology. The Ceragem Research Center put strength on developing home medical devices based on ergonomic design such as the automatic thermal massager. The staff of the Ceragem Research Center has been striving for the innovation of technology since its establishment in 2001. Their continuous effort made Ceragem be in the dominant position in the market now it is playing an essential role in creating a new market. The source of the competitiveness of Ceragem comes from the excellent research environment of the Ceragem Research Center. The research center was located in Gangnam-gu, Seoul when it was established. Later it was relocated to Cheonan, Chungcheongnam-do in 2004 where the company headquarters factory were located. The relocation was arranged to provide advantageous conditions in developing the new product for the research staff to be able to respond to the product problem quickly in connection with the product line. Ceragem is continuously increasing investment on R&D. Ceragem is endeavoring to obtain the technology competitiveness by allocating over 20 billion won to the research development every year. In addition Ceragem is increasing the scale of the R&D center by securing elite research manpower for product development. A diversified technical alliance is in progress such as technical exchange with the advanced companies in foreign countries a participation in the project with the universities research institutes. These days, people’s interest in life is changing from “To live long well” to “To live long in good health”. 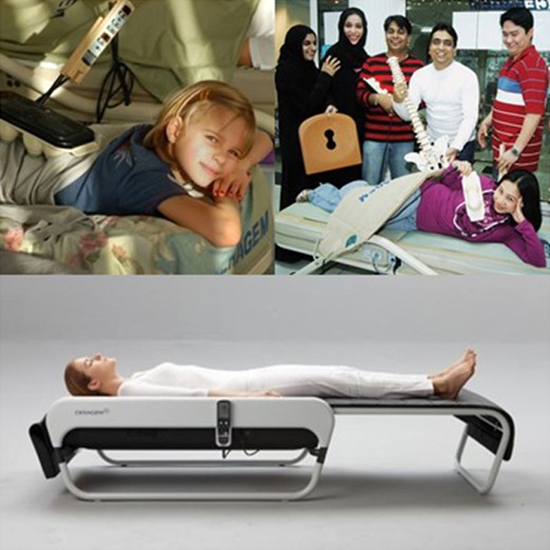 Ceragem is making effort to develop the product for people to have a healthcare at home in convenient way. >> “Trial Marketing” ‘‘Localization Strategy” produced big sensation of Korean Wave in the medical devices! Ceram has been implementing a product trial marketing in 3000 Ceragem Centers in over 70 countries since the launching of its first overseas corporate office in Chicago in the U.S.A. in 2009. Ceragem sells the product to the customers who acknowledged the product effect after trying the product 30 times over a 1 month period at least. The main product for the trial marketing is a spine thermal massager. The jade internal projector emitting infrared radiant heat rolls from the cervical spine to the tailbone massages the spine by providing heat acupressure. The thermal massager strengthens the immunity, loosens tight muscles relieves stress by raising body temperature during the massage session. Ceragem’s trial marketing differentiated from others produced Korean Wave in medical devices all over the world. The popularity of Ceragem medical devices is being continued until today. Ceragem’s unique marketing policy which sells the product to the customers only who tried it keeps bringing a constant flow of visitors to the Ceragem Centers. The average number of visitors to the Ceragem Centers a day over the world is approximately 600,000. The visitors experience the spine thermal massager for 30 minutes for free. The most popular one is the global bestselling product, CERAGEM MASTER M3500 which became a stard for the thermal massager. CERAGEM MASTER M3500 is very popular with its high stability durability. 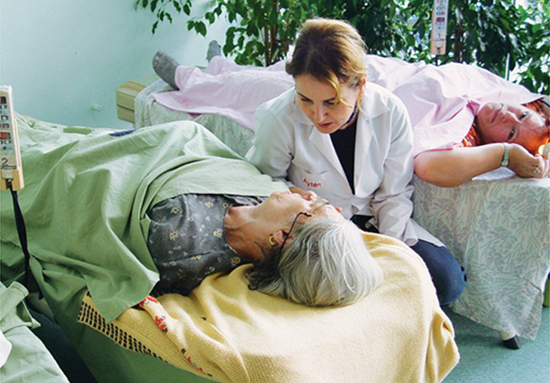 It is a good healthcare partner to the elderly as well as the people in sedentary jobs. 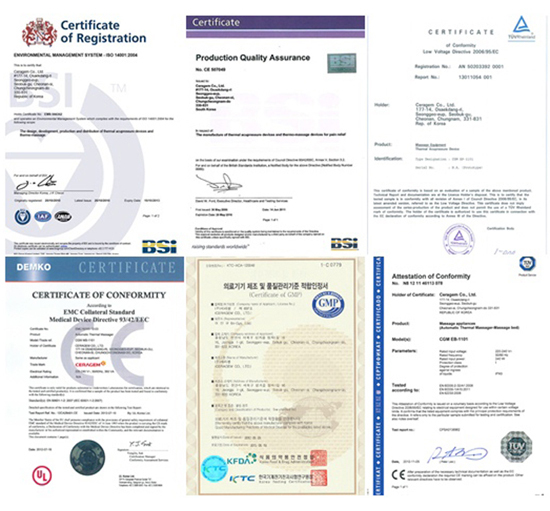 It seems that the popularity of Ceragem products is not going to fade away easily since it is based on the customers’ satisfaction with the quality effect proven by a variety of quality-proving certifications obtained from the many overseas countries. Ceragem’s trial marketing is often mentioned as “adventurous risky marketing” among the businesses of the medical devices. Ceragem’s unique business policy is throwing a question to the medical device industry. Despite the negative opinions about their marketing method, Ceragem maintains its trial marketing because they firmly believe that people can confirm the therapy effect after trying a massager 30 times at least. Although sales slowed down after using trial marketing instead of the conventional product advertisement, the customers’ trust on the product increased it raised the br value high. Supported by the growth of the br value, Ceragem implemented localization strategy actively since the business launching in South America in 2008. For the matter of employment, Ceragem hired a lot of local employees in the countries where they run business. Even for the Korean employees sent from the headquarters were encouraged to learn the local culture to associate well with the locals instead of delivering a Korean way of thinking marketing. One example to show Ceragem’s localization policy well is that Ceragem encouraged the Korean employees to learn Latin song dance. To make local people underst the effect of the spine thermal massager, Ceragem used a comparison method to explain the similarity of therapy concept contained in Korean’s Ondol (hot floor stone) culture Western stone therapy culture. After presentation of the principal of the product, a trial of the product was offered to the visitors. The visitors felt awkward in the beginning but they started showing big response to the product as they got to underst the product better had more product experience. “We don’t sell our product if you don’t try it. Please lie down try it first.” The employees of 11 Ceragem Centers in Buenos Aires, Argentina always say that to the visitors. The employees send the visitors back who did not have time to try the product on their visit tell them to come back to try it on the next visit. It is hard to see urgency for instant sales from the employees’ face. This indicates that Ceragem’s firm belief in the way of doing business is being reflected to the manner of the employees. Ceragem’s marketing goal is to build the stable marketing base for the customers who are loyal to Ceragem product instead of broadening the customer group. President Kim Ik-gyun in charge of marketing in Argentina says, “People of South America are very optimistic compared to the other countries like outdoor activities a lot. People actively introduced Ceragem to families friends, so we had a wonderful marketing result from word of mouth about Ceragem’s products services.” It can be said that the success in South America is the result of the perfect match of Ceragem’s goal with consumer orientation. >> Attached wings to be a global healthcare company! Ceragem’s long term vision is to become a global healthcare company. Especially, Ceragem has been establishing subsidiary companies through M&A under the strategy to reinforce the business of home healthcare field. Currently, Ceragem has 5 subsidiary companies those are CERAGEM LOHAS, CERAGEM HEALTH & BEAUTY, CERAGEM MEDISYS, CERAGEM BIOSYS Ceragem CELLUPEDIC. CERAGEM LOHAS is a professional 21 C-Type health & beauty care company under CERAGEM group. Ceragem is fulfilling its vision to become world best beauty care partner with CERAGEM LOHAS by establishing the beauty science with new concept satisfying the people’s desire need for keeping good health beauty. 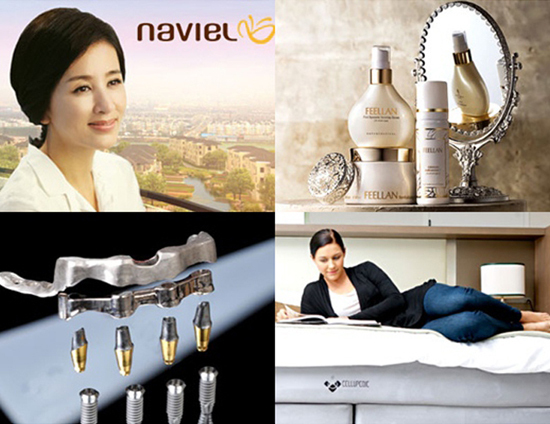 NAVIEL Gallery is successfully running business having over 20,000 visitors a day for a product trial. CERAGEM HEALTH & BEAUTY is a professional global cosmetics company. Ceragem H&B pursues the proliferation of health beauty to all over the world through natural cosmetics. Ceragem is building a global network to meet the sales goal of 700 billion won by 2015. Ceragem is making effort to make the healthy world that everybody is happy including the customers, management all Ceragem employees. CERAGEM MEDISYS has been making an innovative attempt in the field of healthcare diagnostic medical device under the motto “Diagnose all diseases from one of blood”. A blood diagnostic product Labona Check is showing a differentiated competitiveness with its patented technology in the blood glucose meter bio sensor market. In addition CERAGEM MEDISYS has been developing home care product for prevention treatment of acne, protein chemical product various diagnostic devices. CERAGEM BIOSYS has developed dental material “Inovium” which can substitute gold. Currently the company is developing various bio materials related to dental treatment. The company is making effort to manufacture products to meet customers’ expectations sometimes exceeding the expectations. Recently CERAGEM BIOSYS is trying to change the direction of research to new product development from the improvement of the existing products. It is to prepare them to be a lead of the future industry saving depleting resources. CERAGEM CELLIPEDIC is a company developing manufacturing mattresses. The company obtained the technology to analyze the customer’s body type sleeping style adjust the mattress‘s pressure to induce the optimal sleeping condition. The company developed auto mattress adjustment system based on the analysis technology. CERAGEM CELLIPEDIC guarantees a sound sleep to the customers with bladder manufacturing technology, control system research & development on overall science of sleep. Through the growth of the company including subsidiaries companies, Ceragem’s technology br are being recognized in many countries. Ceragem officially obtained “Well-known Marks of China” in May, 2011.The “Well-known Marks” is granted by the State Administration for Industry Commerce (SAIC) of China to the br name according to the evaluation of public awareness in China overseas, total sales amount company’s business activity. Once acquired “Well-Known Marks”, the protection for the br is reinforced by the Chinese government the priority over the counterfeit is given to that br product. The process of request approval of “Well-known Marks” is very strict so it is rare for Korean companies excluding large companies such as Samsung LG to receive the approval from the Chinese government. So acquiring “Well-known Marks” is significant to the same industry. 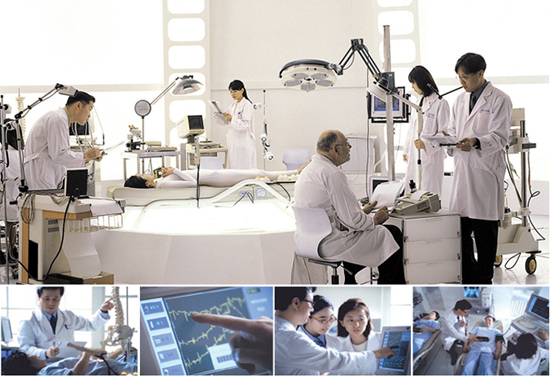 Ceragem launched business in China 2011 by establishing Ceragem Medical Device LLC in Yenji, China in 2001. Started from the one location, currently Ceragem has own factories in Yenjin, Tenjin . Ceragem’s products are being sold through 2,000 agencies in 30 provinces in China. Ceragem’s products are ranked No. 1 in the thermal massager market of China. Apparently, Ceragem’s success in China was attributed to Ceragem’s differentiated marketing. Ceragem’s unique product trial marketing put Ceragem to the top position having the most market share in the thermal massager market in China. Ceragem’s market share rate maintains the highest until present. Especially, obtaining “Well-known Mark” consolidated Ceragem’s position as a premium br in the healthcare market. Ceragem is taking the lead of sales diplomacy in India. The Ministry of Trade, Industry & Energy announced the list of 70 business people including Ceragem Chairman Lee Whan-seong for the economic mission who would accompany President Park Geun-hye to India, Switzerl on January 10, 2014. For the economic mission to India, many companies engaged in construction, power, plant, IT, software were selected to meet the dem for building infrastructure in India. For healthcare company, only 2 companies including Ceragem were selected. Chairman Lee Whan-seong said, “India is one of the most difficult countries to have business. However Ceragem could achieve outsting result out of customers trust based on Ceragem’s trial marketing.” This explains why Ceragem was selected for the economic mission to China, Vietnam to India this time to support Republic of Korea President Park Geun-hye as a civilian diplomat 3 times in a row. Ceragem launched business in India in 2006. Currently Ceragem is running about 3,000 centers in India. Ceragem launched new model V3 in 2013 implemented a diverse marketing plan adapted to the local culture. 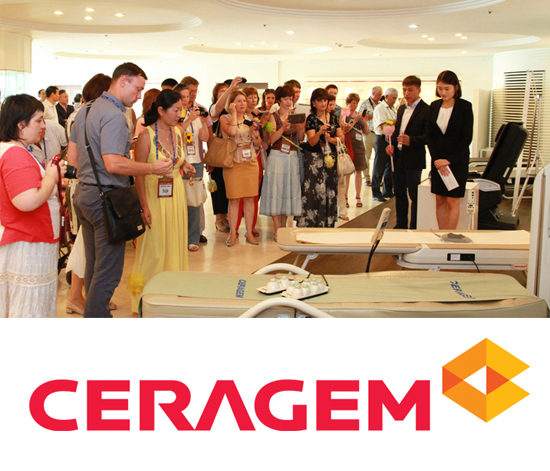 In 2014, supported by the active promotion, Ceragem increased the number of Ceragem store almost double than the previous year. Now “Ceragem Storm” is blowing in India. Chairman Lee Whan-seong said, “Ceragem will strengthen the existing business foundation continuously seek out new business opportunity to raise Ceragem’s company value”. The healthcare company Ceragem has been putting their principal of sharing life into practice by sponsoring many charity events to help neighbors in need. “Making Kimchi” event started in 2011 is becoming Ceragem’s representative year ending event. More employees are volunteering for this event every year. For this “Making Kimchi” event, some cabbages (not whole amount) grown from the garden by Ceragem employees are used. The company encourages employees to grow vegetables at the garden prepared at the company. It is for the employees to experience a joy of harvest sharing with neighbors. The harvest of 2013 increased 4 times more than the previous year so about 800 heads of cabbage were used for a “Making Kimchi” event in 2013. 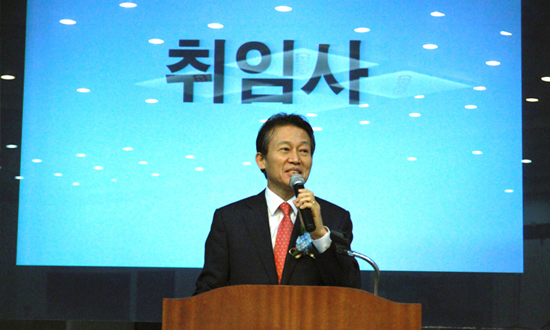 The event was held on November 22, 2013 at the Ceragem Headquarters, Republic of Korea, with the participation of 200 Ceragem family members including management employees. 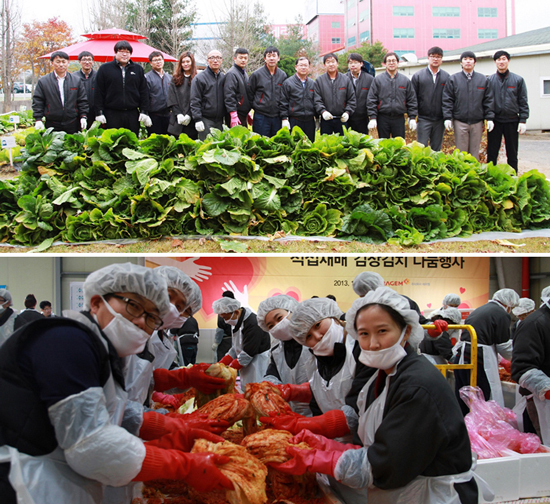 At this event, total 3,000 heads of cabbage were used the Kimchi made from this event was delivered to 3000 low-income households in the neighborhood. 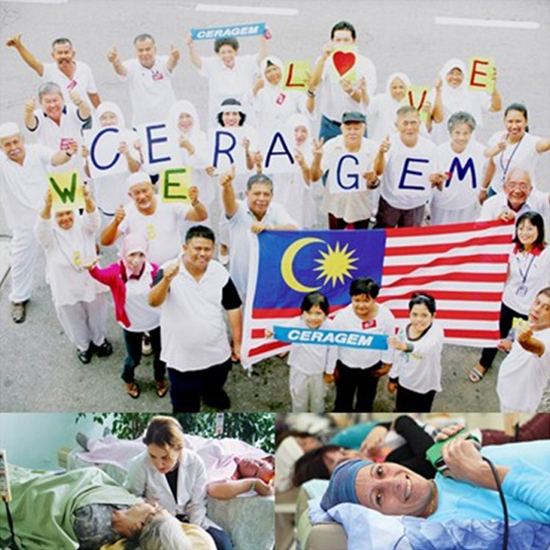 Ceragem is fulfilling corporate social responsibility not only in Korean but in overseas countries. One example is that Ceragem is taking initiative to improve the poor education environment of the elementary schools in the farming villages in China. Ceragem has been participating in the project building hope elementary schools. Ceragem has been donating 2 million CNY (about 35 million Korean Won) for scholarships every year since 2007 to nurture competent individuals for the future. Ceragem has been contributing to the improvement of public healthcare in China, reduction or healthcare cost the modernization of Chinese traditional medicine through development of high quality medical devices. Ceragem’s social contribution is well recognized by the Chinese government. Ceragem was selected as the best company in the field of home healthcare at “Annual Health Awards of China” which is the most prestigious award ceremony in the healthcare field in China. 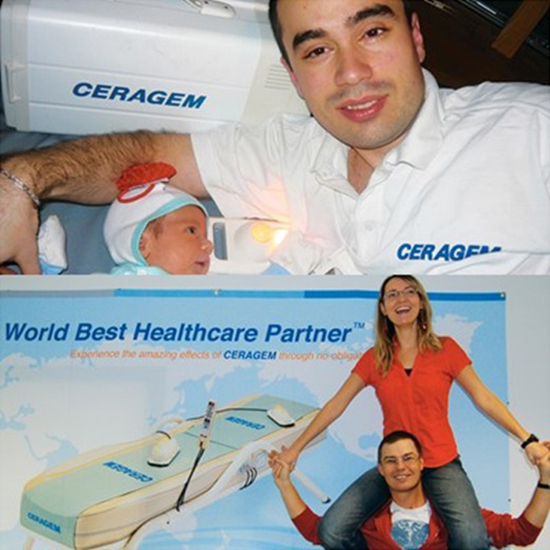 >> Ceragem, Dream of being the world best healthcare company! The thing that Ceragem cares about the most in doing business is global business marketing. After numerous consideration discussions, Ceragem appointed President Lee Wang-gu to the president in charge of the entire business marketing for Ceragem. President Lee Wang-gu is promoted to this position as a president hling the entire overseas marketing of 70 countries after passing through the internal promotion from vice president to the president. The reason that Mr. Lee Wang-gu is promoted to the president for the entire overseas marketing is because of his outsting capability with lots of experience in the healthcare marketing field. President Lee Wang-gu’s various field experience, strong leadership ability of risk management were evaluated highly for this promotion. 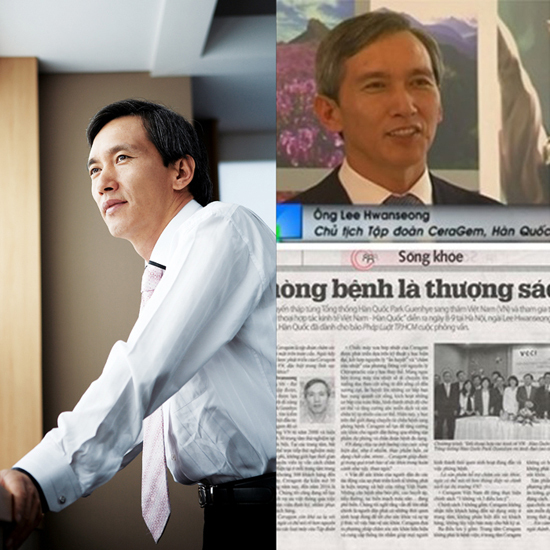 President Lee has been a dedicated worker in out of country since Ceragem’s establishment. He achieved 300 billion won of sales amount in 2008 that is the one of the reasons for his selection. President Lee Wang-gu achieved a rapid growth in India Central & South America with his exceptional management ability leadership in opening the new overseas market. In 2013, President Lee received a presidential award in appreciation of his contribution to increase the nation’s exports at the 50th Trade Day Ceremony. 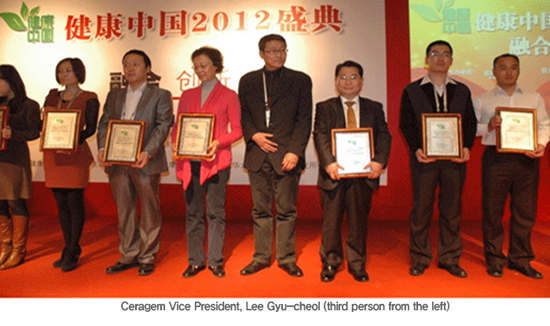 Ceragem will concentrate their effort on developing new overseas market under the leadership of President Lee Wang-gu. It has been 15 years since Ceragem launched overseas business as of 2014. Ceragem has achieved remarkable success so far but it was not easy to make even for the large companies. Ceragem has been pursuing its unique business model based on the creative technology trial marketing. Ceragem has been a partner of healthy life to the customers since its establishment. Ceragem has been pursuing a growth beneficial to everybody based on the world best technology, special customer service creative challenge sprit. That as a driving force made Ceragem a global healthcare company now. Ceragem hopes to become a leading global healthcare company that contributes to humanity the world. In order to accomplish their dream, Ceragem R&D Center has been at the forefront in research development. The marketing team sales team are endeavoring to realize Ceragem’s hope. “To become the world best healthcare partner.” That is the ultimate goal that Ceragem pursues. The global healthcare group Ceragem’s challenge passion will be continued on by delivering culture of healthy life to people over the world.